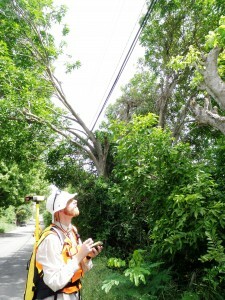 ISA arborist, Neil Shultz records location and condition of severely pruned trees. Geographic Consulting has been the primary contractor on an Roadside Hazard Tree Analysis project funded by the American Recovery and Reinvestment Act. We have used high accuracy GPS units while creating a spatial database containing utility poles, drainage and other critical infrastructure. Over 5,000 public ROW trees have been recorded, measured and assessed for health. This level of detail is unprecedented in the Caribbean and rare in cities in the US. The results are being used to create a roadside tree management plan for the Virgin Islands and a hazard tree mitigation strategy. Please see more about the Tree hazard and Roadside Tree Inventory project by reading our periodic project updates here.